When Capuchin monks arrived at the church of Santa Maria della Concezione dei Cappuccini in Rome back in 1631, they brought 300 carts full of deceased friars with them. They took the bodies beneath the church to a burial crypt and decided to arrange the bones in various decorations. As monks aged and died, the longest-buried monk was exhumed to make room for the newly deceased and added to the decorations. 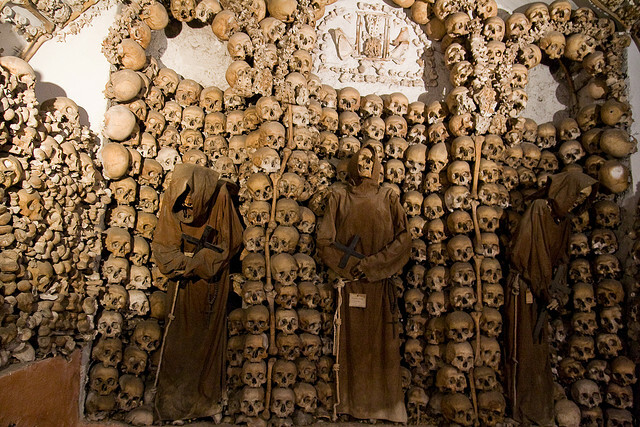 Centuries later, it now contains the remains of three thousand Capuchin friars and impoverished Romans arranged in decorative ways. Large numbers of bones hang from the ceiling as light fixtures and chandeliers. They’re nailed to the walls in intricate patterns, fashioned into crosses, coats of arms, crowns, stars, and even clocks. 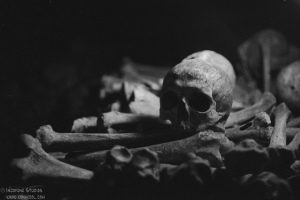 Bones are carefully stacked into high piles, sometimes topped with entire mummified corpses praying on their final resting place. Sometime in the 16th century, authorities realized that the various cemeteries around the city Evora in Portugal were taking up valuable land that could have been used for development. Seeing that the souls of people buried there would be condemned when their resting places suddenly become taverns and iHops, the local monks had a chapel built where they placed all the bones. Concerned about values of society and seeing a chance to send a message about life being transitory and death being inevitable, they decided to put the bones on display. With a name literally meaning Chapel of Bones and a message above the door that reads “We bones that are here, for your bones we wait,” I’d say they accomplished their goal. 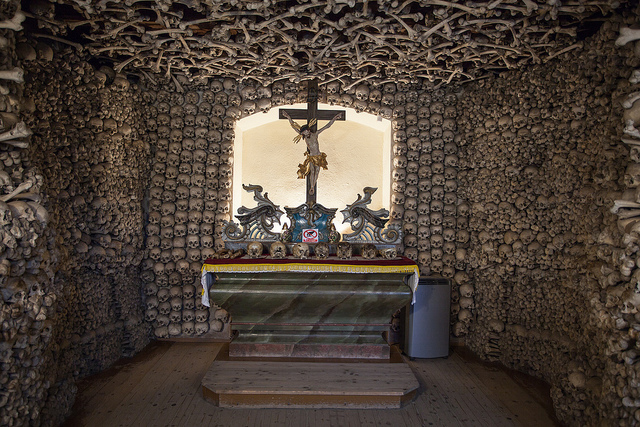 Inside the chapel, cemented into the walls and pillars are human skulls and bones from about five thousand corpses. There are even two skeletons hanging from a wall by a rope. 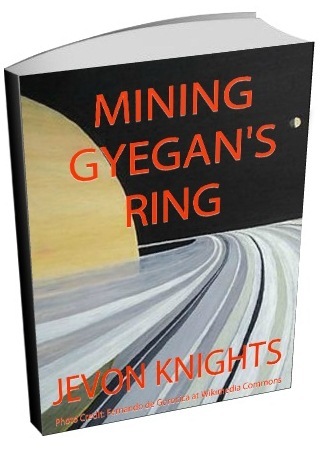 While no one knows who they are, many rumors surround them, the most popular being that the man is an adulterer and the other is his young son and they were cursed to hang there by his wife. 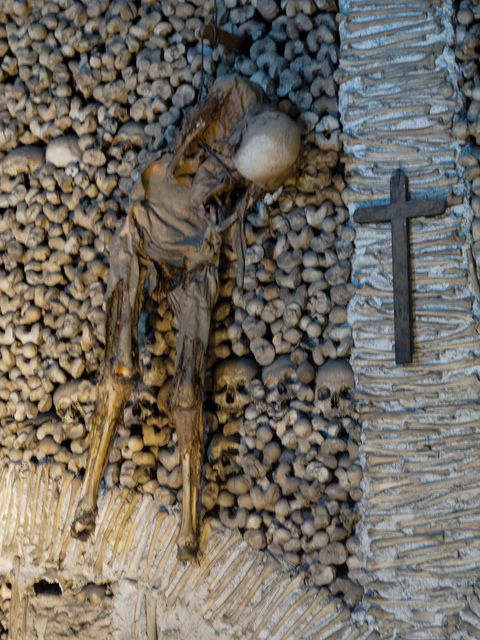 In 1776, a priest named Vaclav Tomasek encountered ossuaries and catacombs during his travels through Rome where human bones were used to make decorations. Feeling inspired, he returned to his village of Czermna in Poland and called a couple of the boys over to discuss his idea. With some help he collected and cleaned and arranged the remains from mass graves left by the Thirty Years’ War and cholera epidemics and plagues, and placed them in a chapel. The walls and ceiling are completely covered and decorated with three thousand skulls and bones, and there are more bones from another twenty thousand people in the crypt below. Similar to everyone who considers this to be a good idea, Tomasek intended the chapel to be a shrine for the dead and a reminder for the living. When Henry the abbot returned to the Czech Republic from the Holy Land with a jar of soil sometime back in the 13th century, he sprinkled it in a cemetery in Sedlec. Word of this spread quickly and soon everyone in central Europe wanted to be buried there. After disasters like the Black Death, there were so many people buried in that cemetery that it had to be greatly enlarged. 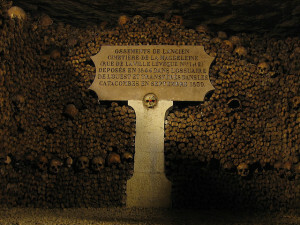 Eventually a gothic church was built and an ossuary was used for the mass graves. One day the monks looked at all the corpses and thought they would make good decorations (because… you know… corpses tend to do that). As if the decorations weren’t enough, centuries later a woodcarver named Frantisek Rint came along and made things really interesting. Today the ossuary contains the remains of over seventy thousand people used to make the place look nice and homey. 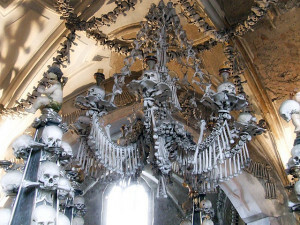 There are bone furnishings, bone coats of arms, a great bone chandelier, and other stuff made from human skulls and remains arranged in artistic fashions. In the late 18th century, mass graveyards around Paris where overflowing with bodies. To solve this problem, the bones were taken and stacked in underground tunnels of an ancient quarry used to build Paris into the huge city we know today, a move that took about 12 years. This underground ossuary now contains the remains of about six million people, earning it the name the World’s Largest Grave. 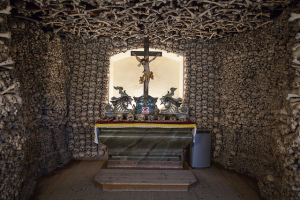 Skulls and bones can be seen stretching from floor to ceiling, some neatly stacked along corridors, others arranged into patterns of crosses and other images. There are miles of tunnels here, not all mapped, and you are quite likely to get loss if you try to navigate it yourself. Only about a mile of this place is open to the public, the rest being illegal to visit. So these are 5 real chambers of bones and human remains. Did you know about any of them? I certainly didn’t. Would you visit them? Let me know what you think or if I missed anything in the comments. I knew about the place of the Capuchins in Rome. I don’t remember reading about the others. I don’t think I’d care to go to those places. There are so many other places to see. Really? I’d love to check them out.